Little did I expect when I drove up to Hinckley Island on the Saturday how much drama I was to meet with that day. Even before the chess got underway, as it happened. 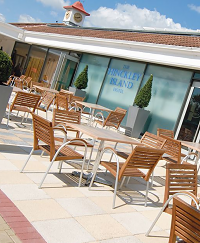 My previous visits to Hinckley Island had been trouble-free as regards hotel arrangements but this one was more colourful. For starters, they had no record of my booking. This had been made for me by Dave Welch so I had to check with him that it had been done, and of course it had. It transpired that the hotel, in its infinite wisdom, had decided that all the various official 4NCL people had duly arrived on the Friday and that nobody could possibly be coming on Saturday (despite this being clearly signalled in my booking) so my reservation had been re-routed to the digital wastebasket. So they had then had to register me all over again and find me a room – thankfully, not a problem, the receptionist told me. Or was it? I was allocated room 503. I went to where she told me room 503 was located, and found myself looking at a blank wall between rooms 502 and 504. Did the numbers alternate with those on the opposite side of the corridor, maybe? No, there was a large laundry room there and no sign of a room 503. I briefly contemplated bedding down in the laundry room, which did look quite cosy with all those fluffy towels. I also considered putting my faith in the existence of room 503 and driving my wheeled suitcase in determined fashion at the wall between 502 and 504 but that sort of thing only works in children’s stories. I traipsed back to reception. Interestingly, two callow hotel staff tried to persuade me that there really was a room 503 but a third (evidently more knowledgable) ruefully agreed with me and proceeded to allocate a room number that came with a door and a physical space beyond. I later learnt that this same room had earlier been rejected by other 4NCL guests as it had a defective window through which a gale-force draught had blown through. But I don’t care about draughts as I’m a chessplayer. 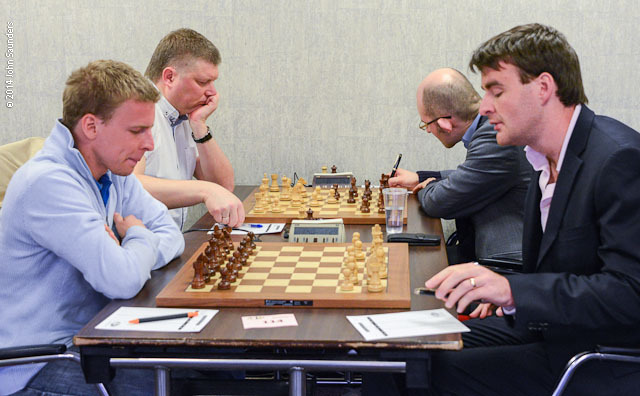 4NCL pairings are of course rigged to keep the really big pairings to the very end, so part of the fun is finding out which super-GMs the big battalions – these days Guildford 1 and Wood Green 1 – are going to deploy on the final weekend. There can be a fair amount of industrial espionage, with the weapon of chessboard destruction is kept back for the final round but may still be spotted lurking somewhere in the hotel. This year the two team managers, Roger Emerson of Guildford and Brian Smith of Wood Green, seemed fairly relaxed about the names in their frames. 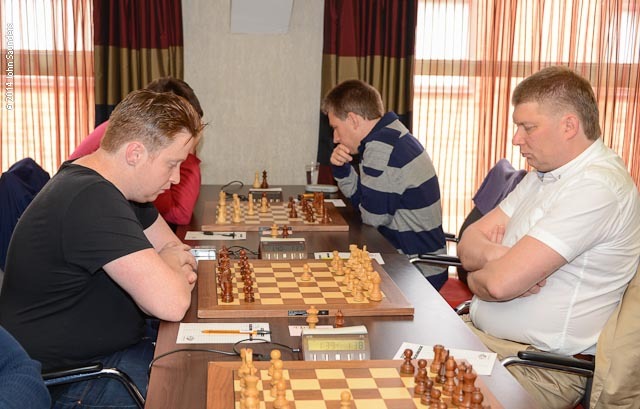 It was known from the start of the weekend that Wood Green would later be deploying Alexei Shirov (who could be seen about the hotel) and Luke McShane (who came later). 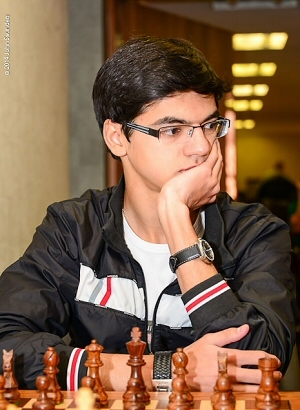 However, I think we were in the dark about the imminent arrival of MVL – as Maxime Vachier-Lagrave is generally known. Of course, it could have all have been a bluff: for all I or anybody else knew there could really have been a secret room 503 somewhere with Magnus Carlsen or Vishy Anand in it. Although both major teams heavily outrated their round nine opposition, it was of course vital to pile up as many game points as possible in order to secure draw odds for the round 11 show-down. As we left things last time, both leaders were on a maximum 8 match points but Wood Green edged Guildford by a single game point. Let’s consider each match in turn. Wood Green 1 6-2 Grantham Sharks: Guildford 1 had finished their match in advance of this one, and Wood Green 1 needed to match their score as closely as possible in order to maintain their slender game point lead. David Howell’s was the last game to finish as he endeavoured to eke out a win against Ameet Ghasi. He didn't quite succeed but a draw was enough to give Wood Green a half game point edge over Guildford. The costliest result in this match for Wood Green was Pia Cramling’s calamitous loss against the 18-year-old English player Peter Batchelor, who did very well to exploit the Swedish GM’s time trouble by posing her a few tactical puzzles in ascending order of difficulty. Jon Speelman dealt severely with Veronica Foisor. Overall this was a pretty effective job by a team with an average rating of 2606 up against one averaging 2310, but the London side could have done with something nearer a maximum 8-0 to maximise their edge over Guildford. As it turned out, their game point advantage was cut to just a half game point. 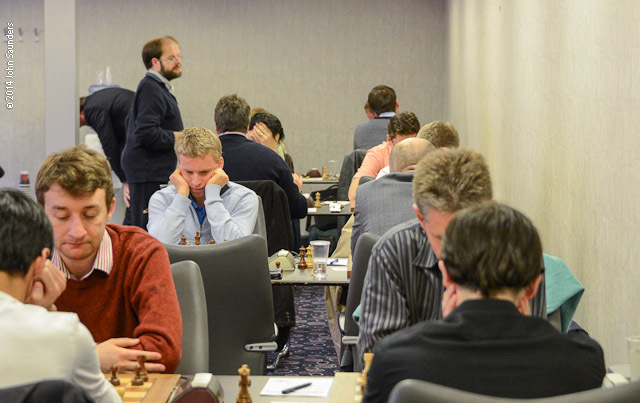 Guildford 1 6½-1½ White Rose: Guildford bolstered their team with two Dutchmen, Anish Giri on top board and Robin van Kampen on board six, and it gave them enough firepower to score a big win against White Rose. As always, the interest came on the boards where the more fancied team did not win. Sue Maroroa, playing against her hubby Gawain’s team and following in the distinguished footsteps of Bob Wade and Murray Chandler in becoming a Kiwi-turned-Brit, played extremely well to defeat GM Mark Hebden. It was her first GM scalp. Guildford 2 4-4 Cheddleton: this was an important match for the minor places, with Cheddleton managing to edge past Grantham Sharks 1 into fourth position. 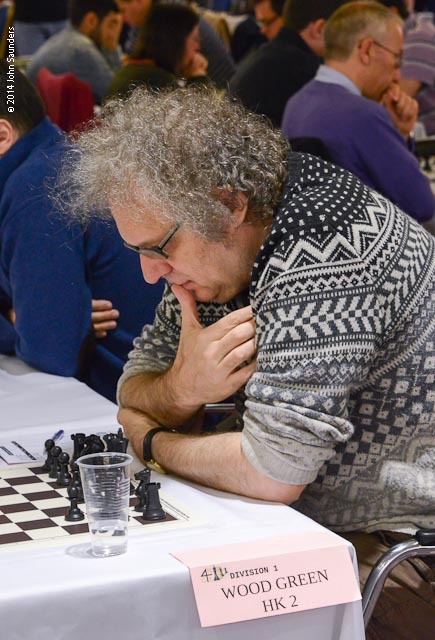 On top board for Guildford 2, Spanish FM Alberto Suarez Real was (according to his team manager) content to cruise to an IM norm with three draws if need be, but he was up against Jonathan Hawkins who needed a win for a GM norm. Consequently the Spaniard’s early peace offer was declined. However, as so often where one side is straining too hard to win, it was the player offering the pipe of peace who triumphed, and rather beautifully. There was an interesting clash between England’s most successful junior and senior players of the moment on the third board. Youth triumphed over experience in a very tense encounter. This win left Yang-Fan needing a win against a 2380+ opponent in round ten for a ten-round GM norm. e2e4.org.uk 6½-1½ Barbican 2: perhaps feeling lonely in the Championship section without their first team, Barbican lost by rather a large margin. 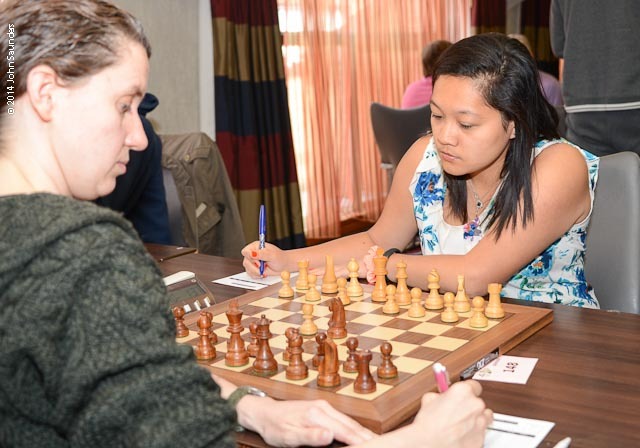 Their two bottom boards gave them a degree of respectability, with 15-year-old English girl player Naomi Wei winning against Lithuanian-registered but long-time English resident Rasa Norinkeviciute. Wood Green 1 10 (32), Guildford 1 10 (31½), White Rose 6 (20), Cheddleton 5 (18½), Grantham Sharks 1 4 (18), e2e4.org.uk 3 (15), Guildford 2 2 (14½), Barbican 2 0 (10½). Grantham Sharks 2 and King’s Head came into the weekend with demotion a virtual certainty but only Barbican 1 could be entirely confident of not being one of the two teams which joined them on the way down. King’s Head defaulted two boards so that was a head start for 3Cs on their way to a 6½-0 victory. 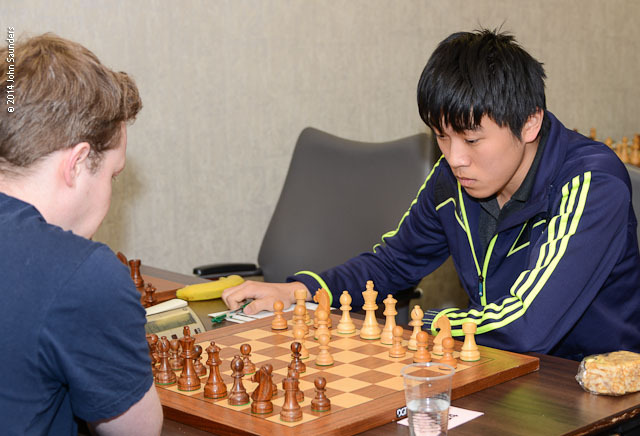 Oxford also defaulted a board and were soundly drubbed by Barbican 1 to the tune of 7-½, one plus factor for Oxford being the draw against GM Turner achieved by Justin Tan on top board, thus keeping him chugging along on his way to a norm. Grantham Sharks 2 turned up with their full complement of players but may as well have stayed at home as they were wiped out 0-8 by Blackthorne Russia, who, in seeking to ensure that they did not drop a division, were significantly strengthened by the inclusion in their side of experienced Russian GM Konstantin Landa. That meant that the only closely contested match of the round in this pool was Wood Green 2 versus Cambridge University, which ended 4½-3½ in the first-named team’s favour. Barbican 1 10 (29), Wood Green 2 8 (24), Oxford 6(18½), 3Cs 6 (25), Blackthorne Russia 6 (24½), Cambridge University (18), Kings Head 0 (19½), Grantham Sharks 2 0 (9). Once again, all eyes were on the game points of the two big battalions, with Wood Green 1 still holding a minimal half (game) point lead at the start of the round. 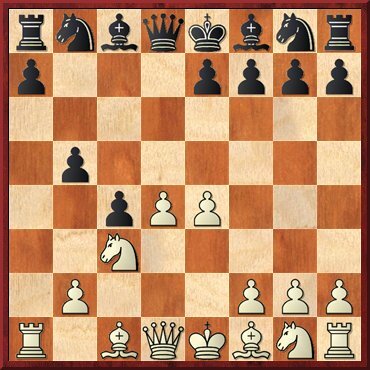 The Wood Green side, with fire on board two in the shape of Alexei Shirov, faced a Cheddleton side with three GMs and an average rating of 2418, while Guildford 1, now equipped with stylish, go-faster stripes on the top board in the shape of French GM va-va-Vachier-Lagrave, would probably hope to score more points against an e2e4.org.uk line-up averaging 2288 and with just the one GM. Cheddleton 1½-6½ Wood Green 1: there were no full-point accidents this time but Wood Green conceded three draws to their opponents, with Jonathan Hawkins, now out of the norm hunt, holding Mickey Adams to a draw on top board. 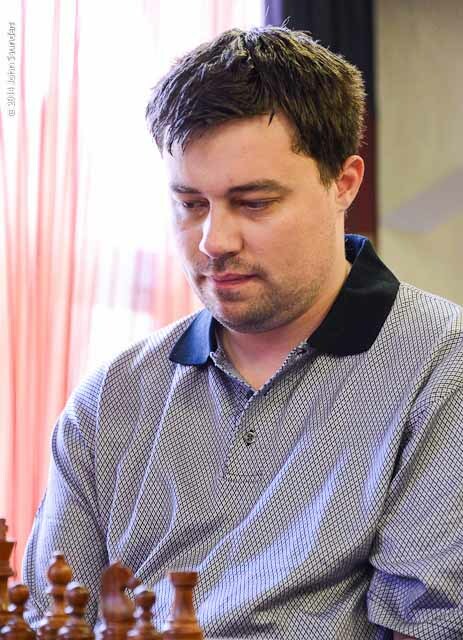 Alexei Shirov against English firebrand Simon Williams was a mouth-watering prospect and did not disappoint. After the game I was able to quench the fire on board by buying Alexei a pint of beer. He opted for Carlsberg but, when he saw my delicious pint of Tetley’s, rather wished he’d gone for that instead. It was perhaps his one false move of the afternoon. 20...Bxd5!? 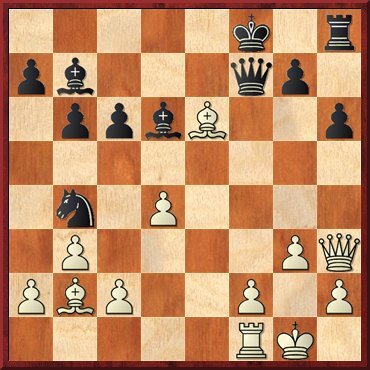 Black, typically, opts for active defence via a sacrifice. If 20...Na4 21.Nxa4 bxa4 22.d6 leads to a solid advantage for White. 21.bxc5 Qxc5 22.Nxd5 Rxd5 22...Qxa3+ 23.Kb1 Rxd5 24.Bd3 transposes. 23.Bd3 Qxa3+ 24.Kb1 Rc8 24...Rd4 would be a great move but for the annoying 25.Bxh7+, picking up the rook. 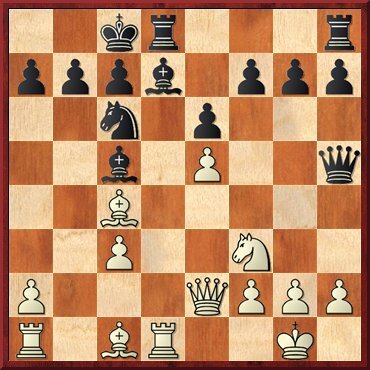 25.Qe1 Qd6 26.Bxh7+!? 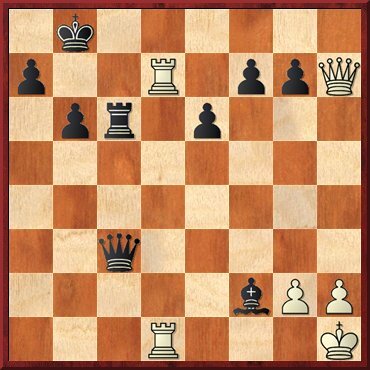 Interesting: computers opt to grind out a win with the extra bishop for pawns, but Shirov prefers to give back the piece for the pawns and a powerful initiative. 26...Kxh7 27.Rxd5 Qxd5 28.g6+ Kg8 29.Qh4 Rc4 After 29...Qd2 30.Qh7+ Kf8 31.Qh8+ Ke7 32.Qxg7+ Kd6 33.Qb2, White is probably winning eventually, though it’s not easy. 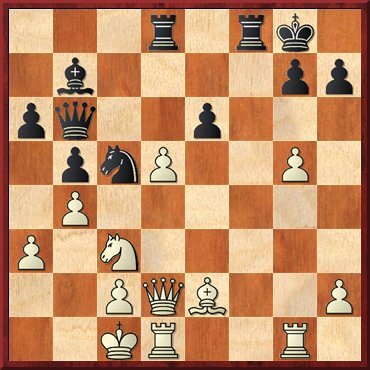 30.Qh7+ Kf8 31.Qh8+ Ke7 32.Qxg7+ Kd6 33.Qf8+ Kc7 34.g7 Qd4! Making White’s task as hard as possible. 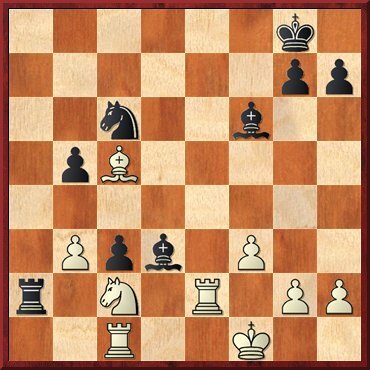 35.Qe7+ Kb6 36.g8Q Rb4+ 37.Qxb4 Forced, otherwise it is mate in two. 37...Qxb4+ 38.Kc1 Qf4+ 39.Kd1 Qf3+ 40.Kd2 Qf2+ 40...Qf4+ makes things a little harder. 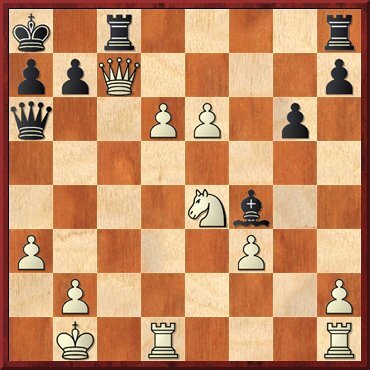 41.Kc3 Qe3+ 42.Kb2 Qd4+ 43.c3 Qd2+ 44.Kb3 Qd5+ 45.Kc2 Qa2+ 46.Kc1 Qa3+ 47.Kd2 1-0 The checks run dry after 47...Qd6+ 48.Ke1 Qe5+ 49.Kd1 Qd6+ 50.Kc2 Qxh2+ 51.Rg2, etc. Guildford 1 8-0 e2e4.org.uk: with the score at 5-0 and three games left, Guildford 1 needed 2½/3 to ensure their game points tally put them ahead of Wood Green, thus providing them with draw odds for the final round. They went one (or rather, one half) better, scoring 3/3, with MVL beating Stuart Conquest, Antoaneta Stefanova winning against Rasa Norinkeviciute and Matthew Sadler outwitting Iliyan Mladenov in a tricky encounter. Barbican 2 3½-4½ White Rose: this was a significant match for White Rose as it secured them third place in the league with a round to spare. Well done to them. Once again, they owed much to Sue Maroroa, who beat Natasha Regan on bottom board with a finish which was not unlike that of her husband in an adjoining room. I asked her about this but Sue was oblivious to her husband’s rooks versus queen denouement, so it was just a coincidence. Jim Plaskett has been informed. Grantham Sharks 1 2-6 Guildford 2: the extra firepower in the Guildford first team trickled down to Guildford 2, and Mark Hebden bounced back from his round nine loss to beat Sam Williams. Alberto Suarez Real took a giant stride towards his IM norm with a quick draw against Tom Rendle, the latter being happy to take the day off after suffering an Adams grind in round nine. I noticed afterwards that Aussie GM Dave Smerdon was having a good-natured whinge on Facebook about being allocated three Blacks over the weekend but he seemed to do pretty well as an All-Black, drawing very effectively with Simon Williams. But there was a real calamity for Yang-Fan Zhou, whose GM norm chances waxed and waned a number of times in a game of four halves (I was never mathematically inclined). In the end he lost and the opportunity evaporated. However, the cloud had a silver lining as his opponent, Peter Roberson, had his own IM norm chances suitably enhanced. He showed good technique to finish the game off. Guildford 1 12 (39½), Wood Green 1 12 (38½), White Rose 8 (24½), Cheddleton 5 (20), Guildford 2 4 (20½), Grantham Sharks 1 4 (20), e2e4.org.uk 3 (15), Barbican 2 0 (14). Barbican 1 2-6 Blackthorne Russia: Barbican 1 had been leaders with a 100% score to date but their lead was cut to game points over Wood Green 2 after their heavy defeat at the hands of super-charged relegation-dodgers Blackthorne Russia, with their genuine Russian GM on board one beating Matthew Turner. Other full points were delivered by Andrew Ledger, Simon Ansell and Richard Bates. 3Cs 3½-4½ Wood Green 2: Wood Green 2 moved closer to the top of the division but 3Cs’s relegation worries became more serious after this nail-biting result. Stephen Gordon seemed to be pressing against Jon Speelman and may have let him off the hook at one point. Another 3Cs man, Adam Ashton, might have been better against Richard Pert but couldn’t convert. As compensation, 3Cs could look to Sophie Milliet’s somewhat fortunate point against Andrew Greet. Jovanka Houska produced a brutal finish involving two knights. 32...Ne4! 33.Kc2 33.Qxe4 Re8 34.Qc4 Rxe2! regains the piece and effects a powerful breakthrough. 33...Ndc3 34.g5 There’s nothing better. 34...Qd7 35.Ne3 35.Nxc3 Nxc3 36.Nh4 keeps the game going but it’s pretty hopeless anyway. 35...Qd2+! 36.Bxd2 Rxd2+ 37.Kc1 Nxe2+ 38.Qxe2 38.Kb1 Rb2+ 39.Ka1 N4c3 takes a bit longer but is still mate. 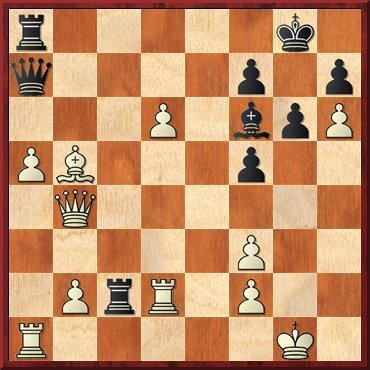 38...Bb2+ 0-1 39.Kb1 Nc3 mate. Grantham Sharks 2 3½-4½ Oxford: Grantham Sharks 2 came close to scoring their first match point of the season but it wasn’t to be as three of Oxford’s higher boards scored wins to put them two points ahead of the demotion places but still not safe. In truth, Oxford might have won by a more comfortable had Zoe Varney not spoilt a clear win against Claire Summerscale. Cambridge University 1 6½-1½ King’s Head: the London pub team was also still seeking its first match point of the season after being beaten comfortably by Cambridge University 1. Despite the win, the university still found itself in the demotion zone going into their final match. Barbican 1 10 (31), Wood Green 2 10 (28½), Blackthorne Russia 8(30½), Oxford 8 (23), 3Cs 6 (28½), Cambridge University 6 (24½), Kings Head 0 (11), Grantham Sharks 2 0 (12½). 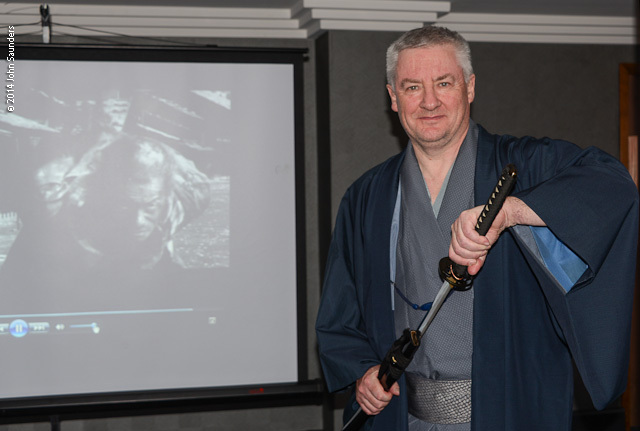 Whilst walking round the venue towards the end of Round 10 on the Sunday, I was surprised to come across the Guildford team manager, Roger Emerson, dressed in a Japanese kimono and carrying a samurai sword. Seeing me carrying my camera, he invited me to an impromptu photo session in a room upstairs from the main corridor. The reason Roger was dressing up was his forthcoming address to his Guildford troops at a private dinner on the night before the show-down with Wood Green 1. I didn’t attend this dinner and am not privy to all of its secrets, but events the next day seem to indicate that it was every bit as successful as Henry V’s rallying of his troops before Agincourt (perhaps not the most apt parallel since two of Roger’s warriors were Frenchmen, but you get my drift). Next day Roger explained to Malcolm Pein and me that he showed his players the film ‘Yojimbo’, directed by Kurosawa. I’m not familiar with that movie but apparently ‘A Fistful of Dollars’ was a westernised remake of it – which, in a roundabout way, hints at a more plausible motivation for his team’s performance on the morrow. So the denouement, and the showdown between the holders Guildford 1 and Wood Green 1. The one personnel change to the two line-ups subsequent to round 10 was the inclusion of Luke McShane in the Wood Green team in place of Nick Pert, with some adjustments made to board order. Guildford’s average rating was 2656 and Wood Green’s 2647, with Guildford players out-rating their opponents on five of the eight boards (by as much as 61 points in the case of Giri and McShane). Remember also that a 4-4 draw would be good enough for Guildford to take the championship on tie-break. Nine nations were represented amongst the 16 GMs on both sides: there were six Englishmen, two Frenchmen, two Dutchmen, one player from each of the Czech Republic, Scotland, Norway and Latvia, plus women players from Bulgaria and Sweden. Wood Green 1 2-6 Guildford 1: the scoreline suggests an overwhelming win for the champions but it did look fairly close – maybe even better for Wood Green – about halfway into the first session. Rapidly improving French GM Romain Edouard set the tone for his team with an adventurous display of counterattacking chess against Jon-Ludvig Hammer. 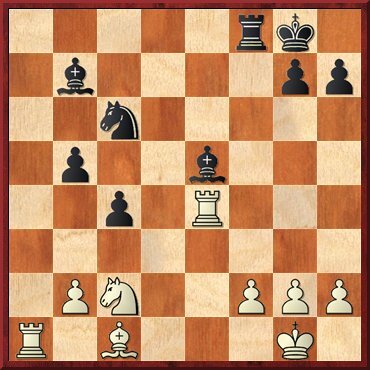 30.b4 Moves such as 30.Kf2 lose to 30...Bxe2 31.Kxe2 Na5! when the threat of Nxb3 forking rook and bishop is decisive. 30...Bg5! 0-1 The cluster of pins and overloaded defences spells doom for White. Jones-Laznicka was a very interesting game and a good example of why you shouldn’t always put your faith in digital engines. Fortunately for me, I had one of the all-time great organic engines at my disposal at an important juncture during the game. Speelman version 1 (a.k.a. Spess or Speelwolf), sitting close to my left elbow and looking over my shoulder at the game on my laptop, took nanoseconds to assess Gawain’s position as close to winning at a stage when his electronic rivals still seemed to think Black was either OK or even better. Of the six English players involved in the match, Gawain Jones was the only one to record a win. Nigel Short and David Howell played out a tense draw, with the older player pressing a little harder for much of its duration. 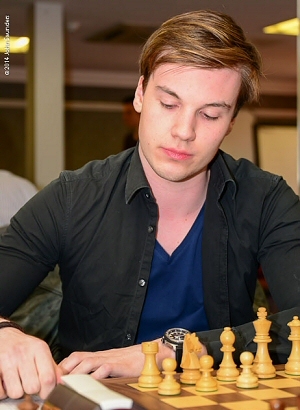 Luke McShane was perhaps Wood Green’s best hope of a win but his edge gradually dissipated and was turned round completely by Anish Giri. 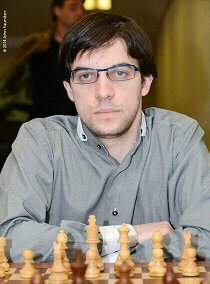 Mickey Adams was also ground down by Maxime Vachier-Lagrave, who is becoming stronger and stronger all the time, comparable to a young Adams, or Petrosian in his prime. The other games were drawn, leaving Guildford the winners by a comfortable margin. Congratulations are due to Guildford and their genial manager, Roger Emerson, who clearly engenders a relaxed and friendly atmosphere in his squad, and in this way he is not unlike his Wood Green rival, the equally affable Brian Smith. One of the pleasures of a 4NCL weekend is to chat with team managers and captains, and this is perhaps a good time to pass on my thanks to all of them for helpfully answering my questions and feeding me stories and info. The league appears to be in rude health and much of this is down to the enthusiasts who give so much time to running teams. White Rose 4-4 Grantham Sharks 1: not too much was at stake here, with White Rose having wrapped up third place in the penultimate round, and Grantham just playing for the honour of finishing fifth or sixth. Having said that, there was a tangible achievement in the match, with James Adair winning a game against Tom Rendle, thereby completing his requirements for the IM title (subject to confirmation, as the officials always insist on me adding). Very well done to him. 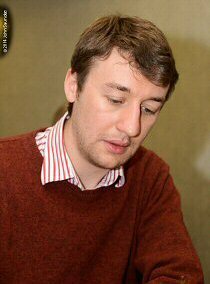 e2e4.org.uk 1-6½ Cheddleton: the latter team finished a creditable fourth in the table after a comfortable victory over Sean Hewitt’s domain name club, who defaulted a board. Guildford 2 6-2 Barbican 2: the Guildford side had the third highest rating average on the day and cruised to a big win. 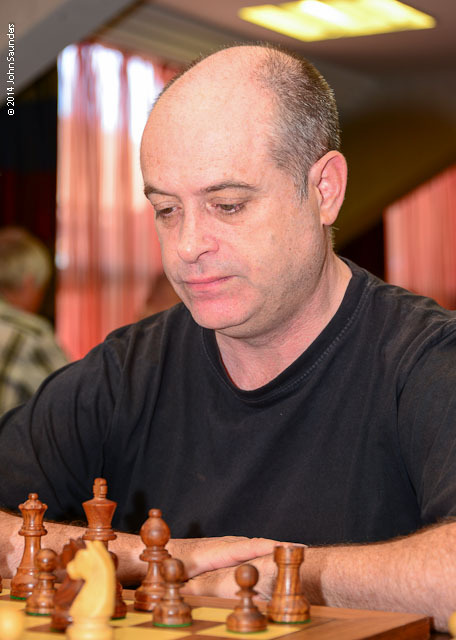 Alberto Suarez Real completed his requirements for an IM norm with a smooth victory over Jonathan Rogers (he obviously likes playing Jonathans, having defeated Jonathan Hawkins in round 9). Wood Green 2 5-3 Barbican 1: the honour of finishing first in this pool went to Wood Green 2, thereby displacing their opponents from the head of the table. There wasn’t a big differential in the ratings of the teams and this was reflected in the fairly close score. Two of the Wood Green side won, with Nick Pert defeating Matthew Turner, while Juan Manuel Bellon Lopez beat Isaac Sanders. Incidentally, the Spanish GM’s colourful scoresheet filling-in caused a flutter of interest when I published a photo of one on social media. Blackthorne Russia 4½-3½ 3Cs: as things stood at the close of round 10, all the other teams in the division were either already relegated (the pointless pair King’s Head and Grantham Sharks 2) or else still in with a mathematical chance of going down. It was 3Cs’ misfortune that they met the Russians at the zenith of their playing strength. Even so, they only lost by one point when they really needed both match points to save themselves. My commiserations and good wishes to this well-organised club; I’m sure they will bounce back soon. 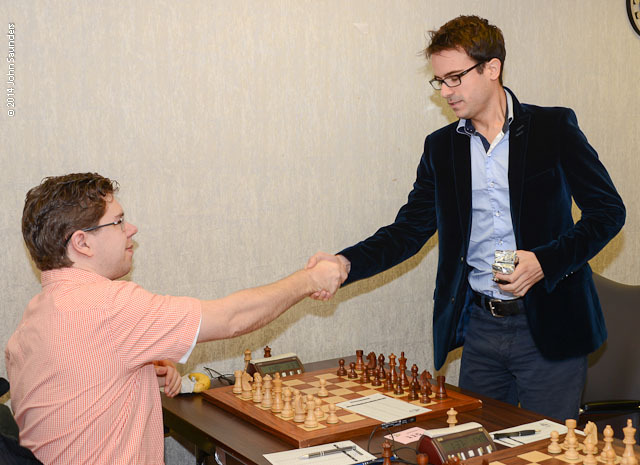 Konstantin Landa proved a godsend to the Blackthorne club, beating Stephen Gordon and completing 3/3 on the weekend. Danny Gormally and Adam Hunt also provided full points for the side, whilst Alan Walton and Daniel Abbas beat much higher rated opposition for 3Cs. 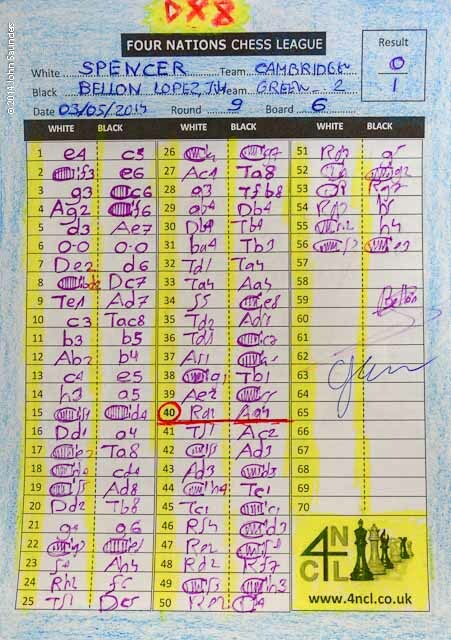 Adam Ashton suffered a lengthy loss to Gormally but his consolation was knowing that he had scored an IM norm as he sat down to play – congratulations to him. The battle to avoid the Division’s wooden spoon was won by King’s Head, despite conceding yet another default. That brought them their first match points of the season, while Grantham Sharks 2’s fate was to leave with nothing (as Anne Robinson used to say on The Weakest Link). 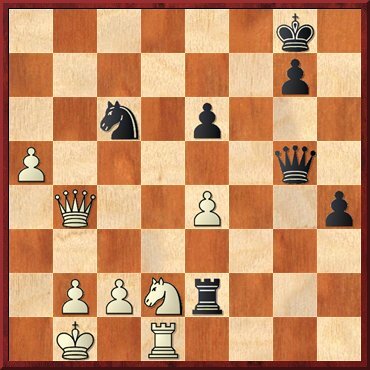 They were a bit unlucky, with their fate turning on a couple of transitions into a king and pawn endgame, which are never easy. Half a point more in either of the games would have reversed the match result. 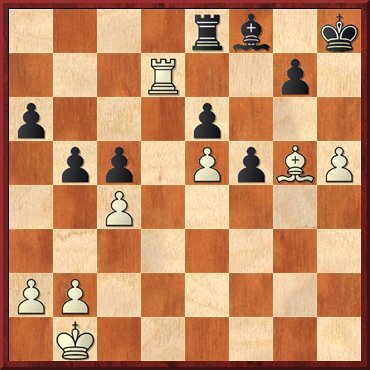 Black to play - capture or not? 43...Bxd2? This time it is better to opt out and play 43...Kf8 44.Nc4 Ke7 45.Kf3 Kd7 when it seems unlikely that White could make progress. 44.Kxd2 Kf7 45.c3! By simple Holmesian deduction, you can work out that this is the only move to make progress, and it does. 45...bxc3+ 45...Ke7 46.cxb4 cxb4 47.Kd3 Kd7 48.Kc4 Kc7 49.Kxb4 Kb6 50.a5+ Kc7 51.Kc4 and it’s simple to see that the b-pawn advances to b5 and eventually the a-pawn will be used as a decoy to win the d- and e-pawns. 46.Kxc3 Ke7 47.b4! 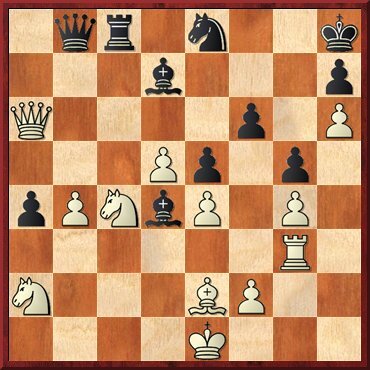 Kd7 48.bxc5 dxc5 49.Kc4 1-0 49...Kd6 50.a5 and zugzwang consigns Grantham Sharks 2 to the basement. Oxford 3-5 Cambridge University: the tensest match of the pool was a sort of unofficial Varsity match (though Oxford don’t carry the ‘university’ handle to their name, and the 4NCL very sensibly eschews anachronistic eligibility rules about who can play for which team). Oxford started the day two match points clear of their opponents but a loss would send them into Division 2 on game points and save the Cantab bacon. When I went to watch the match, it getting towards the sixth hour of play and boards 4-6 were still in progress and the match all square at 2½-2½. Long before, first blood had gone to Oxford when Justin Tan won and clinched his IM norm (actually I think he did it with a point to spare, but of course the point was vital to his team). 15...Ne4? An attempt to blunt the effect of White’s light-squared bishop but it only succeeds in making things much worse. Black should sweat it out with 15...Ne8 when 16.Ra1 Qc5 17.Ra4 is perhaps not as scary as it looks. 16.Bxe4 16.Rxe4 dxe4 17.Nxe4 also wins. 16...dxe4 17.Nxe4 Bd8 A desperate throw such as 17...f5 loses to 18.exf6 gxf6 19.Qg4+ and a routine attack; 17...Rad8 at least has the merit of setting a cheapo but 18.Re3 (18.Ra1?? 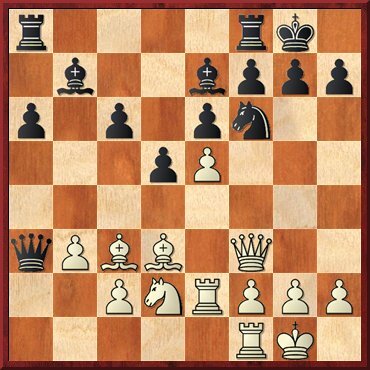 Qxa1+ 19.Bxa1 Rd1+ and mate next move) 18...Qa2 19.Qe2 completes the encirclement of the black queen. 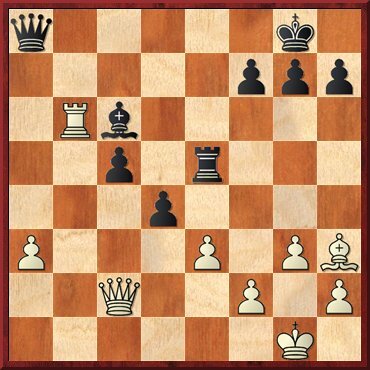 18.Rd2 18.Nd6 Rb8 19.Qe3 is another way to trap the queen; while 18.Ra1 Qe7 19.Nf6+! wins much as in the game. 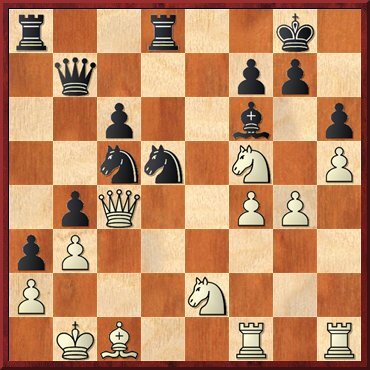 18...Qe7 19.Nf6+! 1-0 19...Kh8 20.Qh5 h6 (20...gxf6 21.exf6 Qe8 22.Rd4 followed by Rh4 and Qxh7 mate) 21.Rd7 Qc5 22.Rxf7 wins. But thereafter things swung back in Cambridge’s favour, with Karl Mah beating David Zakarian and the last three games to finish being won 2½-½ by the Light Blues. 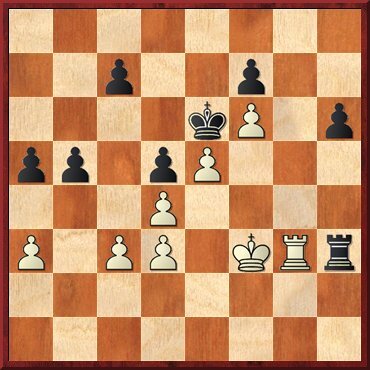 The Eckersley-Waites twins were playing on opposite sides, with the impressively-named French FM Guillaume Camus de Solliers playing an existentialist endgame to beat Tom of Oxford (though careful not to allow him any outsider passed pawns), while Adam the Cantab twin drew an arid minor piece endgame. Dickenson-Bisby was the key game of the match, with both players having chances but the Cambridge finally imposing himself. But there was a curious and well-hidden opportunity for the Oxford man which went begging not far from the end. 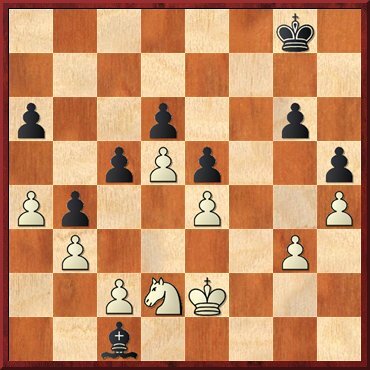 Though White is a pawn up, Black might consider he has adequate compensation. But has he? 45.Na3? It’s not easy to spot but the computer identifies 45.Rf3! as a real chance to win. 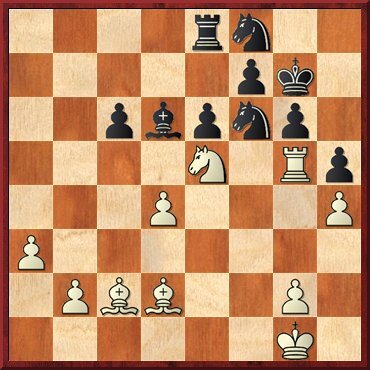 The threat is simply to take on f6 with the rook and there is no obvious defence. 45...Kg8 (After 45...Bxg4?? 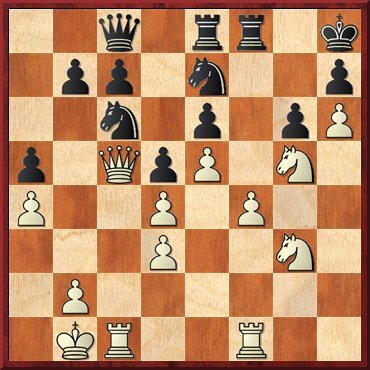 46.Rxf6 wins instantly) 46.Rxf6 Qb5 (46...Bb5 allows mate in two after 47.Qe6+) 47.Rg6+! hxg6 48.Qxg6+ Kh8 49.h7 Ng7 50.Nd6 Be8 51.Bxb5 Bxg6 ... OK, a horrendous line for a human to calculate but technically a missed chance. 45...Nd6 46.Rf3 Now it’s not so effective. 46...Rf8 47.Nc4 Nxe4 48.Bd3? Now Black finds a neat tactic to win. 48.Ne3, to block the g1-a7 diagonal, was needed. 48...Nxf2! 49.Rxf2 e4!! 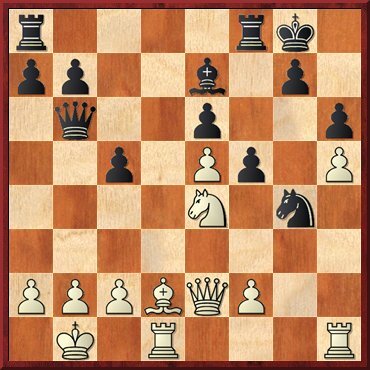 A killer move, opening the b8–h2 diagonal for a queen invasion whilst at the same time providing another defender for f6. 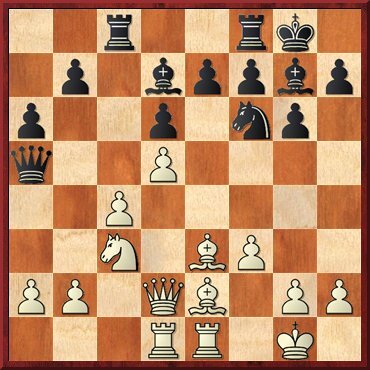 50.Rg2 exd3 51.Qd6 Qe8+ 52.Kd2 52.Kd1 Bxg4+ 53.Kd2 Bf3 54.Rh2 Bg1 is one way to win. 52...Bb5! 0-1 Ensuring a queen invasion on either e2 or e3. 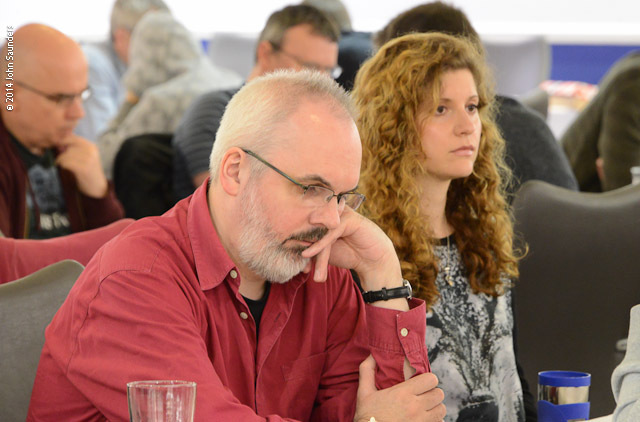 James Adair and Peter Roberson, both England, scored final IM norms and already achieved their rating threshold, so they should get their titles at the next FIDE meeting. Other IM norms: Alberto Suarez Real (Spain), Sue Maroroa (England – also a WGM norm), Adam Ashton (England), Justin Tan (Australia) and Guillaume Camus de Solliers (France). These are subject to official confirmation by FIDE. This was about as tight a competition as can be imagined, with seven teams still in with a shout of promotion as they sat down to play the final round. The first four named are promoted to next year’s Division 1, with the tie-split for third and fourth places based on the game points over the whole season (rather than just the final pool). Commiserations to the four teams who missed out, all of whom could point to the odd extra half a point here or there that might have seen them promoted. Another very tight finish, and West Country club Brown Jack will probably be a deep shade of blue after being demoted on account of a second tie-breaker (fewer points over the entire season). The top four live to fight again in Division 2, while the other four drop into the vast expanses of Division 3. If you’re still with me, 8,000 words on from my preamble, you’ll recall I had a spot of bother registering at the hotel on the Saturday. There was a minor hassle on the way out, too, as the hotel presented me with a bill for twice the 4NCL discount rate. Actually, it was 100% more than I was expecting as a bill for a lesser amount should have gone directly to the league’s man with the cheque book. Tempted though I was to re-enact a scene from Fischer’s notorious exit from the 1967 Sousse Interzonal (tearing up the bill for extras that the hotel unwisely presented to him), I passed this on to our genial tournament director who has no doubt sorted the problem out in his usual unflustered and efficient manner. I think that’s it from me this year. Lastly, I must thank all the league officials who were unfailingly helpful to me and made my time in the back room an enjoyable one.